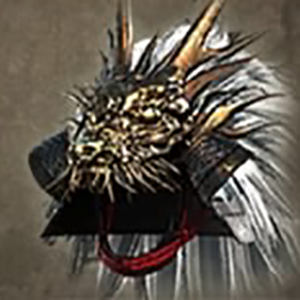 Hiraishi Armour: Kabuto is a Head Armor in Nioh. "A helm adorned with a curved golden crest. This style of helmet is known as a "hoshi-kabuto" due to the many rivets that protrude from the bowl like stars ("hoshi" in Japanese). This heavy armor was owned by Fujiwara-no-Hidesato, a general also known by the name "Tawara-no-Tota." Among his many exploits, Hidesato defeated the samurai insurgent Taira-no-Masakado, and slew a Great Centipede at the request of a dragon god who appeared before him on Setanokara Bridge (present-day Otsu in Shiga prefecture). The dragon presented him with this legendary suit of armor as a reward for performing this great deed. As long as the armor is worn, it is said that no arrow will ever strike the wearer. Many years later, one of Hidesato's descendants abandoned the armor by a river, whereupon it turned to stone. The armor earned its name (meaning "flat stone" in Japanese) due to a legend stating that striking the stone cause the armor to revert back to its regular form."